Tony Rimmington's feature film work includes: The Blue Lamp (1950), Lavender Hill Mob (1951), The Cruel Sea (1953), Titfield Thunderbolt (1953), The One That Got Away (1957), A Night to Remember (1958), Lawrence of Arabia (1962), 633 Squadron (1964), Doctor Zhivagho (1965), Judith (1966), Casino Royale (1967), Ryans Daughter (1970), Battle of Britain (1969), Barry Lyndon (1975), Shout at the Devil (1976), A Bridge too Far (1977), Superman (1978), Jewel of the Nile (1985), Brazil (1985), Dirty Rotten Scoundrels (1988), Memphis Belle (1990), 1492: Conquest of Paradise (1992) Cuttthroat Island (1995), Entrapment (1999) and Anna and the King (1999). Tony remains largely uncredited on most of the productions he has worked on and so this is a far from complete list. For his partially complete credits see Tony Rimmington's Internet Movie Database entry. I talked with Tony about his time on Aliens in early 2000. Q: What can you tell me about the A.P.C. that you were responsible for on "Aliens"? TR: The A.P.C. was basically an airport 'tug', we got hold of an old one, and I gave it the treatment re working drawings, it was built by a firm on Slough trading estate who the SFX department recommended and dropped over the top. Q: Do you have any idea of whose original idea it was to use a jet tug as the basis for the A.P.C.? TR:The towing tractor was Cameron's discovery. The tug was selected after viewing by Cameron etc. at London Heathrow. The full sized A.P.C. was used for everything including the trip to the Acton gas works location (Acton gas works was in the early stages of being demolished) and it was chosen as the location to crash through brick walls (after I had to reinforce the driving facade when I heard of their intentions to do this). Having been very aware of saving weight and not putting it on; 28 tons divided by 4 equals 7 ton floor loading on each wheel? Drains? Pavements? All had to be considered as lbs per square inch started to come up to limit. Q: Cinefex magazine quotes Peter Lamont as follows, "Jim came up with a basic concept for how it should be modified...". Was this a quick sketch, or hand written notes? TR: Previous sketches which I produced for Peter Lamont and his art director kept on being adjusted and time was running out, so off of my own bat I rang Cameron and asked him for a meeting whilst we were in early "prep" time, having seen the different versions, he said " I will do you a sketch of what I want" and from there I started to do the working drawings at 1" scale to his sketch. Cameron produced a very good sketch which was all I required as my background of nine months engineering employ when I came out of the army, on top of my constructional training stood me in good stead. Q: Is this the sketch? TR: Yes, thats it. I remarked on seeing it that he was the first director I had ever met that could draw properly and the sketch was all I required and was completely adequate. James Cameron explained that before he got into the film industry he worked for a coach/bus company on maintenance and after getting into the film industry worked in the art department before becoming a director. 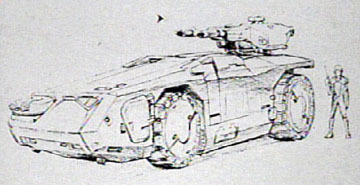 Q: Now, the Laser Disc notes credits you with the making of this model (shown below), based on Cameron's sketch. Did the model go through many revisions or was the first attempt to everyone's liking? 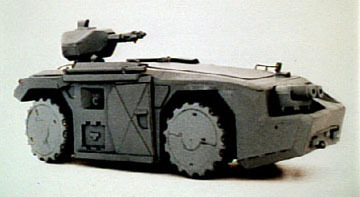 It seems to have a shorter wheel-base than the full scale vehicle along with a few differences in detailing. Were the drawings you did for the full-size A.P.C. made before or after this model was made? TR: After Cameron and the art departments decision that the tug was to be the basis for the design of the A.P.C. we made a cardboard sketch model, not what your LD photo shows at all, what you have shown me is the Halcyon model produced after the film was made. Q: Your contract doesn't say how long you were on "Aliens" for but I'm assuming it was for most if not all of the pre-production period. Is it possible that you contributed drawings for more than the A.P.C. or was this your sole responsibility? TR: I was on Aliens for the duration about 6 months and also got involved with the encasement of German M.G. 42 machine guns (belt fed) to "up market" them for this space age epic. Also other hardware but mostly I was employed solely on the A.P.C. for its construction and for all its operations including one tyre replacement (the tyre weighed nearly 1/2 a ton) and having it on standby as they required it all the time. Exterior and Interior shooting. The usual dramas, having warned all concerned about the interior stage tank in the floor of 'C' stage, this was ignored one day and we had to get a crash crane in to pull it out of the smashed tank top floor where the back-end went in.